High d.c. voltages are usually measured by connecting a very high resistance (few hundreds of megaohms) in Series Resistance Microammeter as shown in Fig. 7.1. Series Resistance Microammeter are built for 500 kV d.c. with an accuracy better than 0.2%. 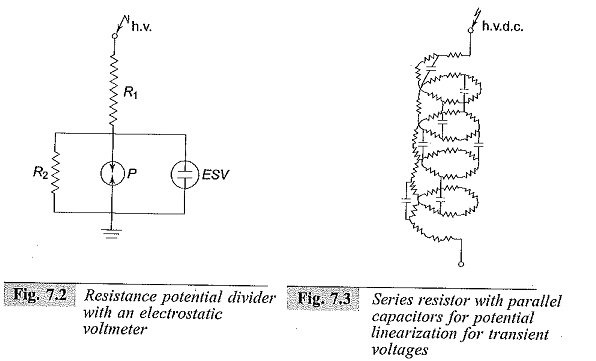 A resistance potential divider with an electrostatic or high impedance voltmeter is shown in Fig. 7.2. The influence of temperature and voltage on the elements is eliminated in the voltage divider arrangement. The high voltage magnitude is given by [(R1 +R2)/R2] v2, where v2 is the d.c. voltage across the low voltage arm R2. With sudden changes in voltage, such as switching operations, flashover of the test objects, or source short circuits, flashover or damage may occur to the ground capacitances. To avoid these transient voltages, voltage controlling capacitors are connected across the elements. A corona free termination is also necessary to avoid unnecessary discharges at high voltage ends. 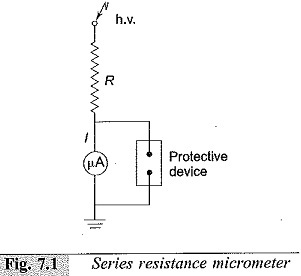 A Series Resistance Microammeter with a parallel capacitor connection for linearization of transient potential distribution is shown in Fig. 7.3. Potential dividers are made with 0.05% accuracy up to 100 kV, with 0.1% accuracy up to 300 kV, and with better than 0.5% accuracy for 500 kV.